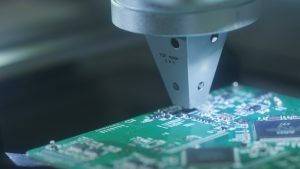 SlingShot’s array of PCB assembly services caters to small-run Production orders as well as Prototype projects. We start with the same focus on high-quality PCB assemblies. And around this, we offer other value-add services targeted to Production requirements. Customized Project Timelines: We offer a variety of project timelines depending on our customers’ requirements. For those urgent needs, SlingShot can procure bare boards and components and complete small Production Runs in four business days. When requirements aren’t as pressing, we can schedule our deliveries out for months. And when those schedules need to change, we are flexible and can pull in or push out schedules. Turn-Key Procurement: SlingShot partners with a variety of bare board fabricators and component distributors so that we can match lead times, price and availability to individual customer needs. Our Procurement Team is expert at streamlining the location, purchase and delivery of material for assembly projects whether they are fast turns or scheduled out for months. Inventory Storage: SlingShot provides storage services for customers that need a controlled inventory process in order to keep components ready for production orders. Material can be stored in climate-controlled cabinets and inventories after each processed order. Testing: When PCBs are headed directly into finished products ensuring quality is key. SlingShot offers a range of testing services including ICT, Flying Probe and Functional through our Wisconsin facility, BEI Electronics. Coatings: For PCBs exposed to environmental stress or potential contamination, SlingShot can coat or pot units with a variety of material to address these external factors. Box Build: Rarely is a product complete with just the assembly of the PCB. SlingShot provides services for the integration into final products.